...on pampers, programming & pitching manure: Fight! Fight! Fight! Yeehaw! Mark and Andre are gettin' scrappy over the Sony-PS3-Blue-Ray issue. Namely, was it a good idea or bad idea to include Blue Ray? OK, they're just disagreeing. But one can hope a good 'ol flame war ensues! I'm going to weigh in with my 2c worth, which is somewhere in the middle, but leaning toward the "bad idea" side. To me, the whole thing boils down to a religious argument. 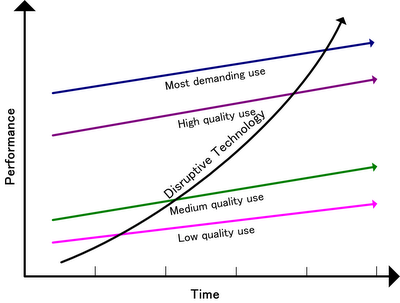 Specifically: (1) Do you or don't you beleive in the "Christensen Effect" aka "Innovator's Dilemma", and (2) if you do, where do you beleive we are on the "mainstream video quality requirements" curve. For a given technology area (let's say, ink jet printers), the customer base has a given level of demand in terms of performance/quality/etc. That demand generally increases over time. Companies building products in the space build products to meet that demand. They then compete to be the best at meeting or exceeding that demand. Each new feature/product is a potential disruptive technology. The problem occurs when the performance/quality/features being delivered EXCEED the usage requirements demanded by the customer base. The dilemma comes from the fact that people at that point are innovating in areas that fewer and fewer consumers care about, and thus are less and less willing to pay for. The ink jet printer case is a great example where we've seen this happen several times over, in each category (B&W, color, all-in-one) etc. In each category, once you hit the demand of the bulk of the consumer base, suddenly, the only vector to compete on is price. Then price rushes downward... provided there is demand. The latter part of that sentence here is significant, and is relevant to the Blue-Ray case here. What isn't shown in the graph above is that at some point, the "___ demanding use" lines taper off. You meet user requirements that will NEVER go up, or at least will take a long time to, and remain below the level of what's being delivered. The crux of the blue-ray arguement comes down to that: Has DVD met or exceeded the user demand for video quality for the foreseeable future? Or will High Def movies and video generate a rush of demand like we saw in the VHS to DVD conversion? The former means Blue-ray (and HD DVD for that matter) stay high in price; the latter means the volumes and demand will quickly lead to an innovation-followed-by-price competition war. Part of this argument is predicated on the fact that games alone won't drive enough volume in drive unit sales to cause this to happen. DVD got cheap because everyone bought one for movies. PC & games usage just rode that train. What I think makes this so interesting is that it's a close call. There's a very strong argument that HD equipment in general is becoming affordable and is very compelling. There's also a strong argument that the delta of 'quality of experience overall' is not as big a delta in "DVD->HD" as it was in "VHS->DVD" and thus won't generate teh same kind of consumer stampede. I agree with all Mark's arguments regarding the benefits to games. I *do* have some disagreement about when/how quickly developers will be able to scale up to that capacity. In the end though, I lean toward the "Blue Ray was a bad call for the new few years" side of things, simply because I beleive the industry is over estimating how badly consumers are going to want to upgrade their home theatre equipment from DVD/standard def to an HD setup with next gen media. I think the expectation of a similarly frenzied upgrade cycle (and resulting price plummet) is grossly overoptimistic. (c) I'm saying it doesn't matter whether the games need it or not - if the movie story is weak, you won't see the adoption needed to drive the component price down to get the PS3 ASP to anything reasonable. Time will tell I guess. I'm not taking any bets though! I already am worried I'm going to have to pay out on my "it ain't shippin' this year" bet! I'm still holding out hope! One thing to note, that Kim neglected to mention, is that the definition of the "performance" curve can change over time, as consumers needs evolve and the technoly advances. So, in the HD media case, the current curve has always been viewed as a visual quality factor. If, indeed, consumer demand for visual quality has been satiated, then they jump to the next curve - perhaps storage capacity, in this case. Only once all curves have run their course, does a technology enter the commodity region of price being the only factor. I think the DVD vs. BD debate equates to two of the parallel, straight lines in the diagram above. BD is not a disruptive technology, it is an expected evolution of existing technology. The disruptive technology is Internet delivery. As a game delivery technology, it starts out worse than all of the existing technologies, but can improve in ways that the existing technologies can't, eventually disrupting the current technologies and making them obsolete. The slowly-sloping-upwards technologies (12x DVD and high-capacity BD) are the best solutions today. But they are slow to change. A console built 5 years from now will have very similar if not identical optical drive specs as one built today. Internet delivery is improving very slowly, but it can continue to improve, and the improvement can accelerate to a point that makes today's best technology look quaint by comparison. It's not about video quality peaking, or storage capacity peaking, it's about a fundamental shift in the way the digital data is delivered to the console. Today's console hard drives are small (or absent altogether), and download speeds are much slower than local optical disc speeds. The small hard drive problem isn't an issue - a terabyte drive in a console will be no surprise in a few years; the local storage part of the disruption is already curving upward quickly. On the content delivery side of the disruption, unexpected increases in bandwidth, or vast improvements in the user experience of background / overnight downloading could suddenly make the DVD and the BD-ROM sub-optimal experiences (less space available AND slower) when compared to playing a wire-delivered game off the console's soon-to-be-ginormous hard drive. When this happens, it doesn't matter what optical drive the machine shipped with, it will sit idle, and the final cost-reduced versions of the consoles will omit them completely.